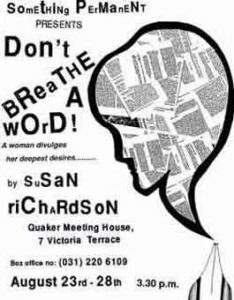 Susan is the author of four plays and worked, for several years, as playwright, performer and workshop facilitator for Something Permanent, an educational theatre company with bases in both the UK and Toronto, Canada. Her first play, Two Of Me Now, is a poetic drama about biological and literary motherhood, as reflected in the lives and work of Virginia Woolf and Sylvia Plath. Intimately connected through their language and the play’s central image of the sea, the two writers engage in a dialogue on female creativity in life and art. Two Of Me Now has been performed throughout the UK, at the Summerworks Theatre Festival in Toronto, and at Helsinki, Turku and Tampere Universities in Finland, with the support of the British Council. It has also been published by Cecil Woolf (Virginia’s nephew!) in his literary/academic imprint, the Bloomsbury Heritage Series. Don’t Breathe A Word, a play about writing and censorship, was awarded first prize in the Timberlake Wertenbaker Playscript Competition and shortlisted in the National Student Playwriting Competition. It has been performed at the Edinburgh Fringe Festival, Platform 4 Exeter Theatre Festival, the Cheltenham Festival of Literature, in an On The Edge season at several theatres in South Wales and in Barons Court Theatre, London. Take. Eat, a play that explores body image and disordered eating, grew out of the writing residency Susan held with Why Weight? in Australia. It was performed in theatres, community centres and schools in both Adelaide and Tasmania. Susan won the Classic FM Woman of Tomorrow Arts Award and was a finalist in the Cosmopolitan Achievement Award in recognition of her playwriting and educational theatre work.